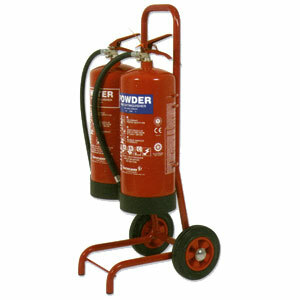 The double fire extinguisher trolley is the essential accessory for multi-risk fire-fighting. Ideally suited to many applications such as construction sites, petrol forecourts and heavy industrial sites. Designed to withstand the rigours of active use as well as considering for the ergonomic requirements of the user. Optional fire bell and bucket stand can be selected in the options below (fire extinguisher not included).